First, secure the child restraint with the LATCH lower anchors (rear outboard seat positions only) or the seat belt, as applicable. Flip up the anchor cover 1 from the anchor point which is located directly behind the child seat. Position the top tether strap over the top of the head rest. Secure the tether strap to the tether anchor point on the rear parcel shelf. 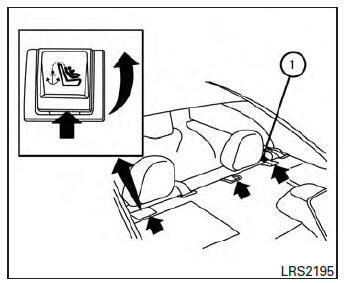 Refer to the appropriate child restraint installation procedure steps in this section before tightening the tether strap.